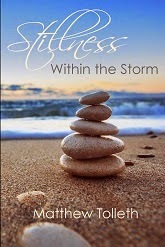 Today we are interviewing Matthew Tolleth, author of the self-improvement book Stillness Within the Storm. I’m a small town farming boy from the Willamette Valley. My High School graduating class consisted of 62 young adults. I served our country thereafter in the Navy for 4 years. I have been so far west that I felt I was going east in this world. I have been exposed to many third world countries and their cultures in my travels. My job titles include everything from Machinist Mate, Assembling fitness equipment, to pouring Mud (concrete), Aircraft Mechanic, Medical Assistant and last and foremost Team Leader. Describe the purpose of Stillness Within the Storm in a few sentences. The purpose of my book, is to help my reader adjust the way they can view the world. Just not so in how they view the world, but how my reader can adapt to have their world move around them and not through them. Everyone can find their own connection with Stillness within the Storm. It is written to guide any reader to discover a new element within themselves. To always move forward, to find a new foundation within their life to build upon. What inspired you to write a book about helping people find the life they choose? Because, we are always influenced by others(on a minute by minute basis) to; Act, feel, listen and follow what current media influences that tell us what how we should think, act and assimilate what they (media) think we need to feel what important in our life is. Hmmm… Honestly? We are influenced on how we “should” raise our children! We are influenced on how we serve “breakfast” to our children. We are influenced on the ultimate way to “secure” the perfect life to our family. In the end? All this influences that are making decisions for you? Does not serve your own personal needs. It serves the needs of dollar signs on others pockets! One of the major themes of your book is finding stillness. How do you define stillness? Stillness is being observant of every moment around you without being absent within it. Stillness is an acute observation of your life’s moments as seconds tick forward in time. It is really difficult to help everyone understand why finding our “stillness” is important today for us all. Discovering our own personal “stillness” gives back to all of us, the ability to guide our life where as the storm of existence moves around us. When you find your own personal stillness? You will move forward each and every day as the storm that is life, flows around you. What are some of the major obstacles people face in finding stillness? Today our stillness is “overshadowed” by TOO much information, TOO much stress, and TOO many things other people are telling us we “Should be doing”! I suggest that we move away from our constant influences of advertisement on a minute by minute basis. “Kill your TV” was not a bad idea when it was suggested so long ago. My writing is designed to move the idea; from me being a writer making an impact on another’s life, to writing in a direction that will help impact my reader to discover what they really need to understand themselves on a personal level, to make the best change for themselves. I am already into three chapters in my next endeavor. In my current working environment, I realized that the minority of my work group has had marriages lasting longer than 25 years. Most of my work group are on their second marriage. And just a small percentages of that minority is “content” in their current marriage (over 25 years). I am asking, on a personal level, “what makes marriage really work” And on that, I will ask permission from the minority group to give guidance to all; who are currently married, thinking about getting married, or are on Spouse # 3. Be warned… I will help you discover your own ego and how it influences the life you live. If you can accept your ego and better understand it? The loving, wonderful-loving presence you really are, will ascend to be who you really were meant to be.